The Minor Labor Law is a child labor law poster by the Louisiana Office Of Human Resources. This poster is mandatory for some employers, including employers of minors. This poster must be posted in a conspicuous place where all employees will see it in any place that employs minors. This poster describes the maximum hours minors are allowed to work per day and per week and what hours minors are allowed to work during the school week and during non-school weeks. This poster also describes where minors are not allowed to work and what happens to employers who violate this law. It appears you don't have a PDF plugin for this browser. 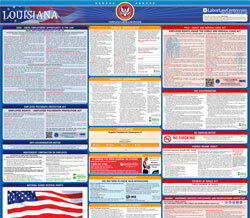 Please see the link below to download louisiana-minor-labor-law-color.pdf. such minor issued by the city or parish superintendent of schools. or suffered to work except as provided in RS 23:151. • 8 hours on a non-school day or 40 hours in a non-school week. not be included as part of the working hours of the day. each work day, before the commencement of the next day of work. superintendent for the school district in which the minor resides. are extended to 9:00 p.m.
hours in any week when school is in session.
. In logging operations; 10.
health, safety or welfare of such minors. minor, constitute  a separate of fense .